In a Medium post published yesterday, Ceukelaire said he liked to participate in the Data Abuse Bounty Program that Facebook recently launched in the wake of Cambridge Analytica scandal. So, he started looking at the apps his friends on Facebook had installed. Ceukelaire then decided to take his first quiz through the NameTests app, and as he started taking a closer look on the test process, he noticed that the website was fetching his personal information from "http://nametests[. ]com/appconfig_user" and display it on its website. What Was the Flaw? How It Leaked Users' Data? The vigilant hacker also made a video as a proof of his findings, demonstrating how the NameTests website revealed your personal data even after deleting the app. Ceukelaire reported the flaw via Facebook’s Data Abuse Bounty Program on April 22, and over a month later the social media informed him that it could take three to six months to investigate the issue. Over two months after initially reporting the issue to Facebook, Ceukelaire noticed that NameTests has fixed the issue, and told him it had found no evidence of abuse of the exposed data by any third party. On 27th June, Facebook contacted Ceukelaire and informed him that NameTests had fixed the issue, and at his request, donated $8,000 to the Freedom of the Press Foundation as part of its Data Abuse Bounty Program. 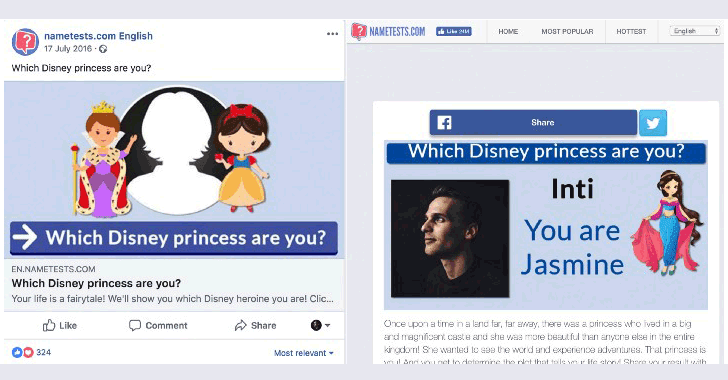 German company Social Sweethearts, who is behind NameTests, claims to have more than 250 million registered users and have reached more than 3 billion page views per month. The latest incident shows that, even after the social media giant changed its conditions for apps to access data on its platform back in 2015, Facebook failed to adequately police such apps that have access to substantial amounts of personal data on its platform.